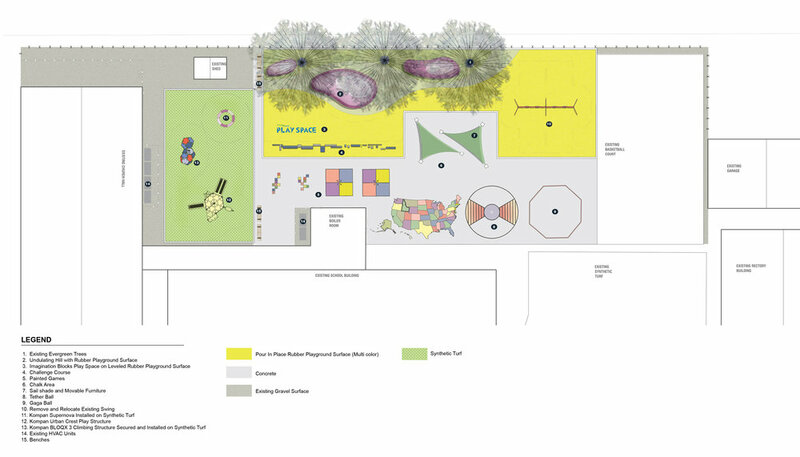 St. Nicholas Catholic School Playground Design — The Land Group, Inc. Designed as a place to encourage creativity, build strength, and support social activities, the new playground at St. Nicholas Catholic School presents unlimited opportunities for the students in the limited space. The new design had to provide multiple functions in the existing space, such as an engaging playground, an outdoor classroom, and an assembly place. It also had to accommodate the existing HVAC units on the outer walls of the existing buildings and the four large evergreen trees near the rear fence. The design met these challenges by combining both structure and structure-free play opportunities. It allows the uses of the space to be interchangeable, giving the students and teachers the opportunity to form space according to their needs. The center of the playground features two structure-free play areas. The concrete paved area near the existing boiler room has 4 different types of painted games. Additionally, the space under the shade structure can be used as both concrete canvas for chalk painting and a seating area. A gagaball court located at the south edge of the playground separated painted games from the existing basketball court. The two shade structures are set back to the east of the playground and leave a 100 foot long clear space in the painted game area for relay races, assembling, and events. The other structure-free play area contains a group of undulating hills, an imagination play area, and a row of challenge courses. The undulating hills provide topographic change in the playground, together with the PVC pipe tunnels below give the students a sense of three dimensions. The hills are located under the existing trees, utilizing the natural shade for cooling in hot Idaho summers. The imagination play area contains many sizes and shapes of blue foam block to encourage children to build different kinds of structures: a chair to sit on, a castle to live in, or as an aid for climbing. Play structures are proposed to be located at the north side of the playground. They act as colorful visual screenings for the HVAC units on the exterior wall of the church hall. Synthetic turf in this area provides a safe fall zone for students. This playground goes beyond a place for just play and provides an environment that supports and enhances each child’s development through creativity, physical fitness, social activity, and opportunities to learn from the world around them.